Posting purely to share the photo which was taken from Cruach Mhór on 21 June 2014. Pat looking back at the Devils Ladder. We were forced to descend by it on the May weekend due to bad weather/fog. The descent was very tricky with lots of loose rock and very slippery conditions. Started at V772 871 A and finished at Kate kearneys cottage the next day. Once again hello to the Bishopstown Hillwalking club ,(we met Sean Cotter and the gang on top of Caher). (Walk description continued from Cnoc na Toinne.) From the summit of Cnoc na Toinne we had an easy walk back down to reach the saddle at the top of the Devil’s Ladder, 100m lower down. 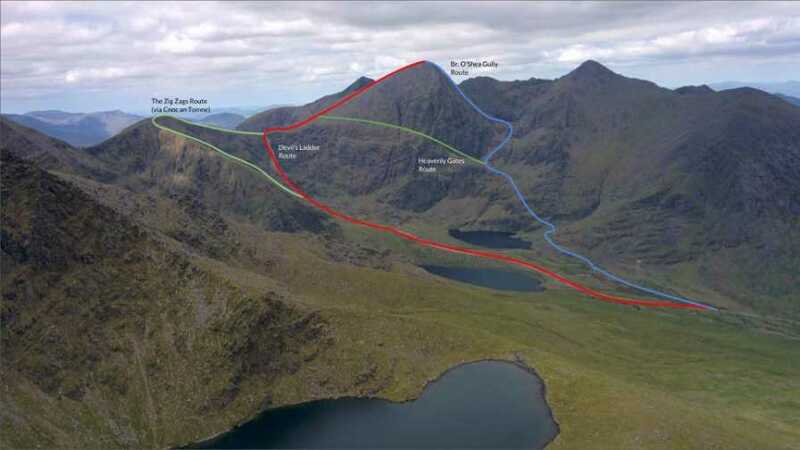 There was still 300m of climbing left on a rocky path to the summit of Carrauntoohil. Sadly, it was in the fog! Not the slightest view around! 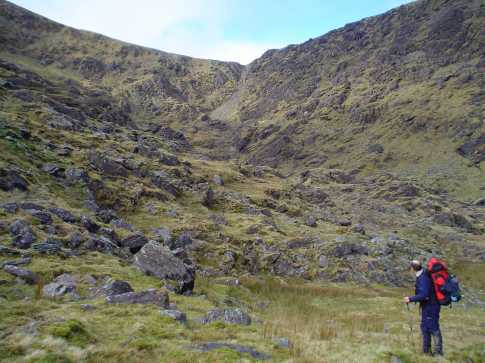 But this ascent was challenging for me and I was delighted to have made it. We had really earned our sandwiches in the shelter! 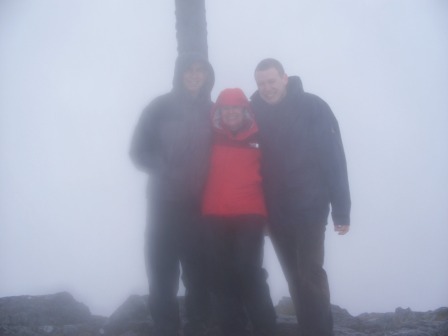 On Bank Holiday weekend 6.05.2007 with a group of 4 friends me and my husband climbed Carrauntoohill. We took the Devil’s Ladder route since it seemed to be the least dangerous one (some other routes lead along the ridges and don’t look too safe). Despite the bad fame of Devil’s Ladder, we took this route in bad weather. It was raining and became foggy closer to the top. The rocks were very slippery and muddy which made the walk quite unsafe. When we got to the top of the ladder we were so tired that we found it very hard to continue walking towards the cross. It was quite cold and windy. Although I was quite surprised that despite the bad weather we met a good few people on the way. Finally we descended the same way which was quite tricky and needed care. I must say that Devil’s Ladder could be a much easier route for a dry and sunny day, with amazing views. 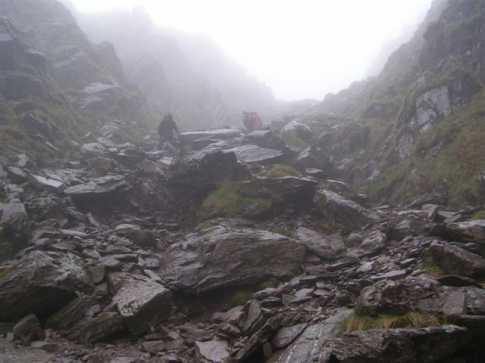 But I wouldn’t recommend going to Carrauntoohill in bad weather. It could turn into a nightmare if you slipped on the rock or even got lost in the fog.